>> I kind of love that is rained all day Saturday. Something about it felt so cleansing! The streets, sidewalks, cars...and everything are just so dirty and I felt like the rain was washing some of that away. >> I've been desperately trying to track down this magic product since I read a post about it here. I'm so curious to try it and I'm even more interested in the eye liner/lash serum thing it comes with as well. I went to two different targets yesterday with no luck. Have you heard of it? >> My cousin, Holly, sent me some sample of doTerra essential oils after we had long conversation about how they've changed her life. They just arrived and I'm so excited to start using them. I'd heard so many great things and I think they will be an awesome addition to my life. If only so that I can at least try this trick. Also, they came at just the right time because I had an allergic reaction to a face mask I made last night (I think it was the cinnamon) and the lavender oil was just the thing to soothe my scorched face. >> I made my own face wash last week and I'm SO loving it. I'm planning to do a full post soon on my current skincare routine as well as the natural products I've been loving but so far this face wash is a definite winner. Also, did you know that Trader Joe's is now selling manuka honey? Day. made. >> I've been trying to clean house and use up a bunch of products before buying new ones (so hard for me). I've been storing the "empties" in hopes of doing a full post on the products I've finished. Would that be interesting to any of you? 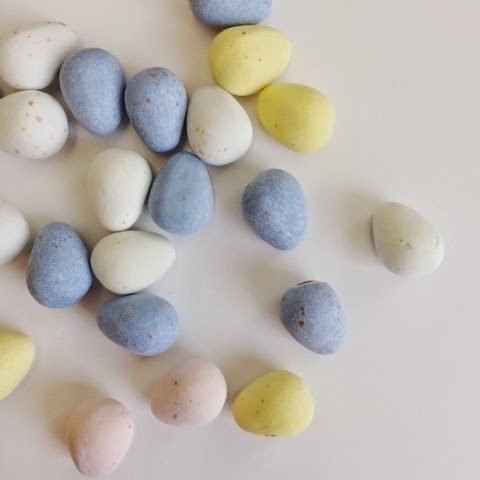 >> Mini Cadbury eggs. Enough said. I would LOVE to learn more about the products you've been using around your home. I am 100% inspired by the way you have been moving towards a more natural routine with makeup and skincare - it definitely make me more aware of what I am putting ON my body (not just in it, with food). Thank you, thank you for sharing! Please keep it up! Miss you!